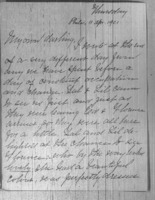 Date is exactly "1901 April 11"
Margaret Wilson tells her sister about a costume party she had with her friends and the wedding of their Uncle Edward. Stockton Axson tells Jessie Wilson Sayre about Edward Axson’s wedding and wishes her a good recovery from surgery. 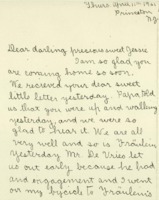 Eleanor Wilson McAdoo writes to Jessie Wilson Sayre to say she is glad Jessie is coming home, and to give social news.